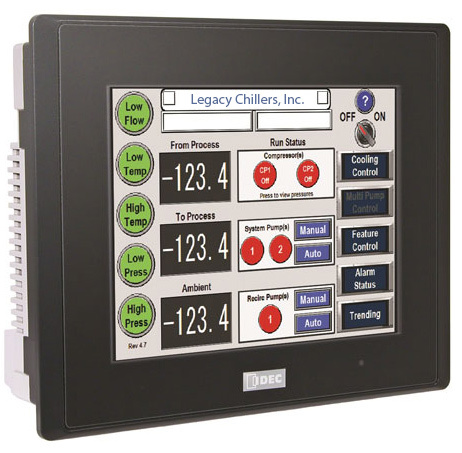 Microprocessor Controls for Process Chillers | Legacy Chiller Systems, Inc.
As micro processers have evolved over the last few decades, process chiller manufacturers now have unique opportunities to provide enhanced control features in a cost effective way. We have listed features considered to be CRITICAL in today’s process chiller market. We have placed these items in order of importance based on extensive customer interviews and 2013 market research. Commercial and industrial process chiller applications such as data centers, semiconductor testing, custom OEM, print processes, storage tank cooling, telecommunications, welding machines, lasers – military sector, laser – private sector, plating process and injection molding. Medical and pharmaceutical applications such as MRI magnet cooling, PET scanner cooling, CAT scanner cooling, operating room cooling, lab testing systems and induced hypothermia systems. Food and beverage industry applications such as bakery processing, distilled spirit production, pasteurization cooling, craft brew cooling, commercial ice production and custom batch cooling. The ability to update the control interface (screen) and / or the programmable logic controller without needing to remove these devices from the chiller. A common method is to download updates, ideally at no cost to the customer, from the manufacturer’s website and transfer the files to the chiller’s equipment via a USB jump drive. This critical feature assures equal wear and tear on the chiller’s compressor(s). Once the lead compressor run hours have extended past the lag compressor hours by approximately 500 hours, service duty of the compressors will switch. This critical feature assures equal wear and tear on the chiller’s system pumps. Once the lead pump run hours have extended past the lag pump hours by approximately 500 hours, service duty of the pumps will switch. In some cases, process chillers are mounted in remote locations. In these cases, it may be advantageous to have the capability to turn the chiller on / off remotely. Having an input on the chiller’s control system to perform start / stop is a critical feature. Using a standard Internet browser, such as Internet Explorer or Firefox, user has the ability to access and control the chiller over a local area network. Note: In most cases this will require custom IP addressing. Using a standard Internet browser, such as Internet Explorer or Firefox, user has the ability to access and control the chiller over a wide area network. Note: In most cases this will require custom IP addressing and firewall port forwarding. Virtual Private Networking (VPN) is used to connect a process chiller remotely over a secure network connection. A VPN can be used to remotely connect to a chiller via an Intranet or Internet connection. VPN typically does not require firewall configuration. Process chiller control systems use pilot duty relays to control the various systems within the chiller such as compressors, pumps, fans and economizers. When these relays are board mounts it requires replacement of the entire board as compared to field replaceable plugin relays that result in much less downtime and cost. Should a process chiller’s operating condition become unstable, it is considered ideal for the chiller’s control system to broadcast a trouble email or text. Note: In order to broadcast the chiller must be connected to the host building’s network with access to the Internet. Some firewall configuration or VPN connection may be required. 15 Control Screens with built-in help features. Automatic SYSTEM PUMP Lag/Lead with FIVE operational modes. 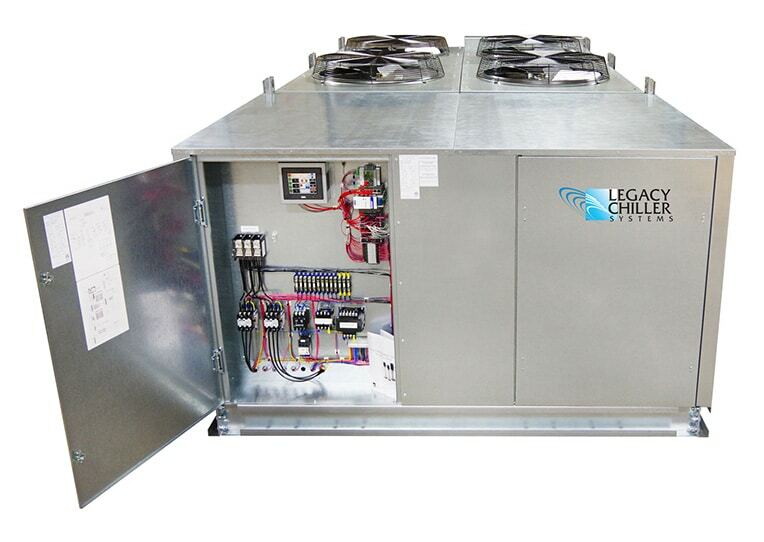 Factory configured for ALL Legacy available chiller options. Powered from the chiller 24 volt control circuit. No high voltage interference. USB update slot for IN-PLACE HMI and PLC software updates available from legacychillers.com website. Preprogramed remote start/stop set up for customers dry contact connection. Pentra PLC outputs control IDEC’s RV1H pilot relays rated to 6 amps. The RV1H relays are plugin and 100% field replaceable. Pentra PLC/HMI have been load stress tested to an ambient temperature range of -10F to 120F. HMI provides onboard help with troubleshooting tips. Using QR codes (shown) on screen, users can access detailed troubleshooting tips and video’s via Legacy’s dedicated web server. Expandable I/O, ideal for custom (OEM) chiller projects. 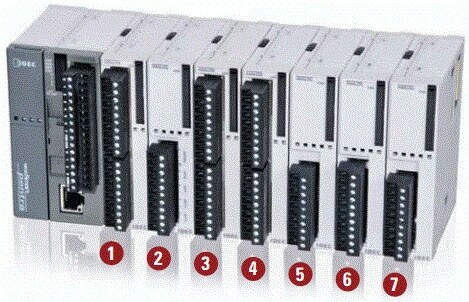 I/O status indicators on Pentra and I/O modules. Optional service alerts. Get an email or phone call about potential maintenance or service issues. Using native networking capabilities of PENTRA multiple remote HMI’s connected to chiller can be accomplished. Using EWON (optional), a secure VPN connection is now possible for remote Intranet or Internet operation of chiller via IE, Firefox or Chrome browsers. COMING soon via EWON (optional) Legacy will provide a subscription based Mission Critical monitoring service.